Are you a Veteran or surviving spouse? You may qualify for financial assistance. 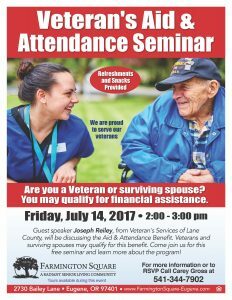 Join Farmington Square on Friday, July 14, 2017, at our free Veteran’s Aid & Attendance Seminar from 2 pm to 3 pm. Guest speaker Joseph Reiley, from Veteran’s Services of Lane County, will be discussing the Aid & Attendance Benefit. Veterans and surviving spouses may qualify for this benefit. Come join us for this free seminar and learn more about the program! For more information or to RSVP, please call Carey Gross at 541-344-7902.